This is the first post in a three-part series about my site’s 2017 redesign. 20 years ago, techno-utopians rightly recognized that the internet in general and the web in particular would democratize the distribution of self-expression in a revolutionary way. Over the next decade, the number of blogs sharing art and recipes and poetry and personal stories grew seemingly exponentially, and their proliferation in the wake of the dot-com crash was a testament to the noncommercial, grassroots nature of the movement. As hand-coded sites gave way to hosted blogging services, the market for a lower barrier to entry for online expression became clear, and before long, social networks took over the world. Nowadays, the only people with personal websites are those who find the offerings of social networks and other third-party services insufficient. Those insufficiencies are typically about control, and for me, they mainly boil down to a handful of issues, which the redesign I’ve launched today aims to address. Nothing lasts forever. The vast majority of tech startups are lucky to survive more than a couple years, and the ever-consolidating handful of corporate giants housing our memories online have little reverence for the trove of human experience they oversee. When these services disappear, our stuff disappears with them. Even if we’re able to export everything and find a new home for it, that new home will be just as precarious. Our lack of autonomy is compounded by being spread out all over the internet. We leave little pieces of ourselves in countless digital spaces, making a full accounting of what we’ve shared inconvenient at best, and impossible at worst. The intention here is that while V6 gives old, previously isolated content a more stable home with a broader context, seeing a post where it originated can be more evocative of its time and place, especially if the design has been preserved. A post as it originally appeared on V4 in 2005. The same post as it appears on V6 in 2017. Of course, that won’t be possible for every post. At the time of this writing, the archive pulls content from 31 different sites and other sources, some of which are no longer—or never were—online, which brings me to…. Web pages don’t have a great track record of sticking around. 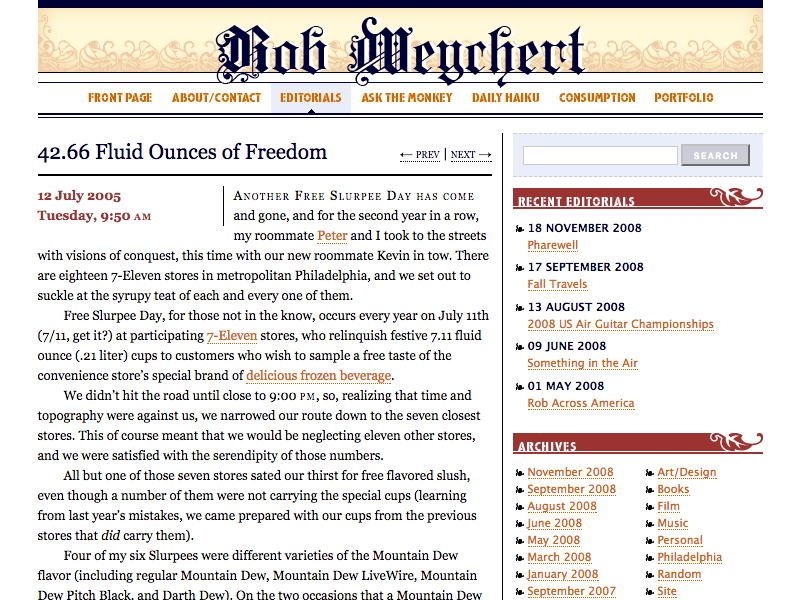 Over the years, I’ve shared links to thousands of interesting things on the web. Now that I’ve got most of those outbound links in one place, analysis reveals that hundreds of them are now broken. Virtually all broken links to previous versions of the site are now fixed, and going forward, new versions will live on subdomains, too, so these kinds of .htaccess shenanigans won’t be necessary in the future. Anyway, the point is this: I’ve been sharing things online for more than half my life, and much has been lost. Ephemerality has its place, and I’m sure plenty of my nonsense belongs on the scrap heap. But hopefully the approach I’m taking now will give more of my stuff a reliable home for as long as it needs one. I’m a designer. I’m pretty particular about how ideas are organized and presented. Facebook, Twitter, Medium, et al may offer users a modicum of customization, but whatever you’re publishing is mostly at the mercy of a designer who’s never met you. Having a personal site gives me a place to experiment and allows me to package my ideas with as much precision as I need. I’ll go into more detail on V6’s typography, proportions, and color in two forthcoming posts, but for the moment, suffice it to say that this is the most robust web design playground I’ve built for myself so far, and I’m looking forward to getting my hands dirty. The substance and frequency of what I’ll post here remain to be seen. If Letterboxd reviews and monthly link digests continue to dominate the archive as they have for the last few years, so be it. Writing is difficult and time-consuming, and I know from experience that my patience for it ebbs and flows, so I have no plans to pressure myself with schedules or quotas. However, my intention is to get back to regularly sharing creative projects and documenting my thoughts on design and culture, and I’ve worked hard to make this a great place to do that. Wish me luck!